Last week, the oil price lost about 4.9% and is now trading around 52.40. In addition to the growth of American reserves of “black gold”, the quotations were negatively affected by investors' concerns about the trade negotiations between the PRC and the United States. Earlier, President Donald Trump stated that he would not enter into a major trade deal with China before discussing it with Chairman Xi Jinping again. On Friday, it became known that there would be no meeting of the leaders until March 1, which means that the transaction will also not be signed within these terms, and the threat of a new increase in American export duties remains. This week, US-China trade negotiations will continue in Beijing but their prospects are vague. The instrument is under additional pressure by Baker Hughes Oil Rig Count, which increased from 847 to 854 units. 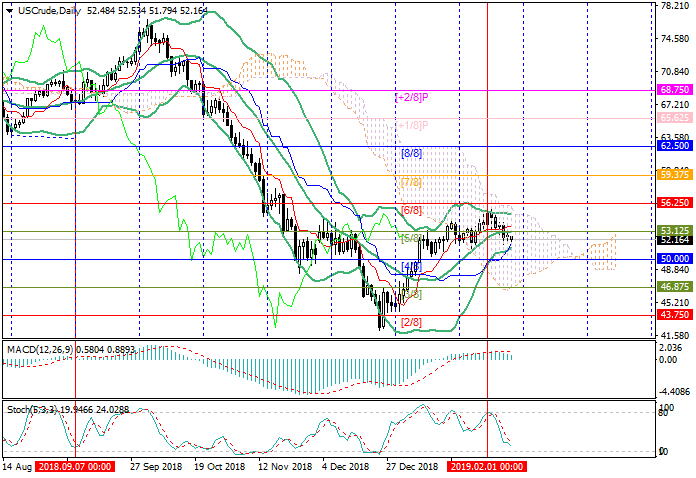 The price fell below 53.12 (Murrey [5/8], the middle line of Bollinger bands) and may continue to decline to the levels of 50.80 (Murrey [1/8], H4) and 50.00 (Murrey [4/8]). After the consolidation above the level of 53.12, the gain to the level of 56.25 is possible (Murrey [6/8]). This variant of movement seems less likely because the MACD histogram decreases in the positive zone and Stochastic is directed downwards. Short positions can be opened from the level of 52.00 with the targets at 50.80, 50.00 and stop loss 53.00. Long positions can be opened from the level of 54.00 with the target at 56.25 and stop loss around ​​53.20.